Earlier this year a black swan was admitted to a Perth wildlife shelter after it had landed in one of Alcoa’s caustic red mud lakes. The bird’s injuries included burns to its head, eyes, beak, throat and legs as well as internal poisoning. 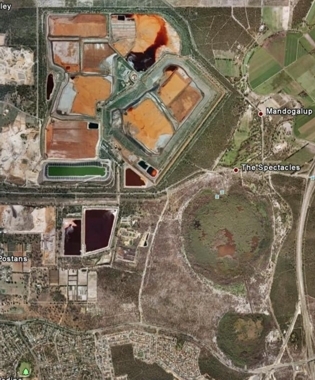 The caustic lakes at Alcoa’s four alumina refineries in Western Australia are settling ponds for red mud, a highly alkaline waste material that is both radioactive and contaminated with heavy metals and other pollutants. For very tonne of alumina produced by Alcoa, two tonnes of this residue result and Western Australia produces 12 million tonnes of alumina a year. It is therefore not surprising that the storage of this waste is a significant problem that has faced the industry for many decades. Alcoa’s solution to this problem is to create red mud lakes and allow the waste to dry out in the open. 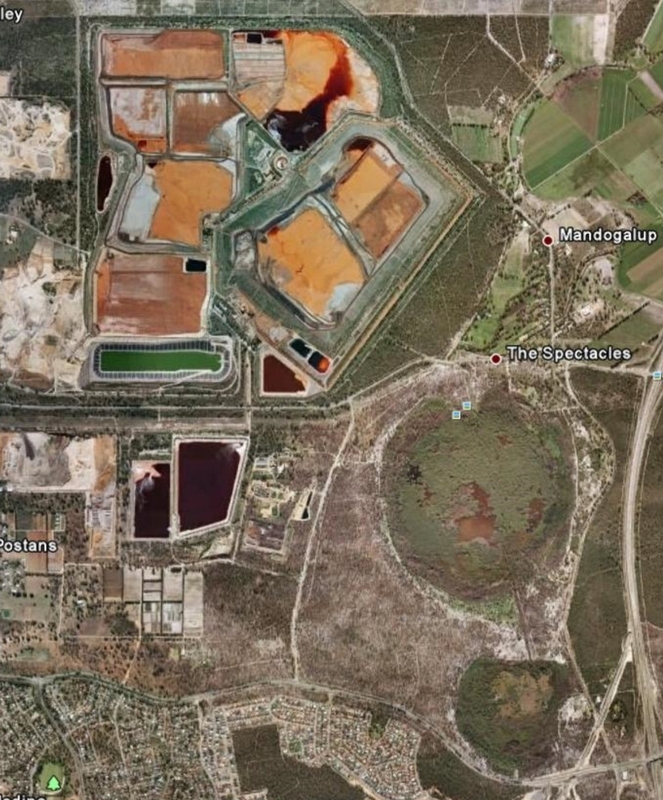 Alcoa’s Kwinana refinery is located directly next to a wetland containing a couple of lakes called “The Spectacles”. When these lakes dry up as they have done recently it appears that swans in particular find the red mud lakes attractive to land in. Swans being swans immediately have a drink of water upon landing and when that burns their throat they then proceed to have another drink and so on. Alcoa's Kwinana refinery next to "The Spectacles"
According to Alcoa this occurred 3 or 4 times in 2009. In the first 2 months of 2010 there has already been that number of casualties. Typically when this happens an Alcoa worker onsite shoots the swan. 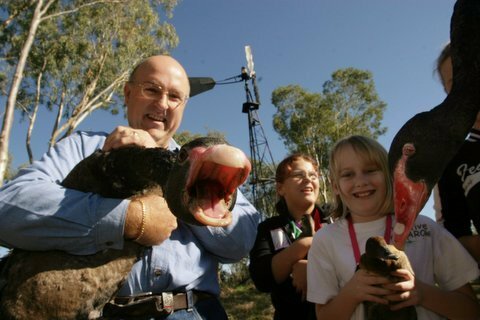 Alcoa have a licence to do this from the Department of Environment and Conservation (WA) and in case you are wondering, shooting is deemed to be a humane form of euthanising a bird if it is over 3kg. Should Alcoa attempt to cover these lakes? The West Australian government has deemed it acceptable that Alcoa can create these vast caustic red mud lakes and leave them uncovered. Further they have also given permission to shoot our state bird emblem whenever they land in these poisonous bodies of water that are located next to existing wetlands. A Google-Earth view of southwest WA between Perth and Collie reveals just how huge these red mud lake areas are, they can be seen from an altitude of 500km! As for our injured swan, an avian vet thought she had a chance so an intense program of bathing, applying creams and tube feeding (4 times daily) was undertaken. Our main concern was that about a third of her tongue had been eaten away but nevertheless her condition appeared to be improving. On one morning several weeks later the lower portion of her beak just fell off and she unfortunately had to be euthanased.